Characteristics The rat tissue blot is designed for proteomics research in screening for antibody and protein expression. It carries 8 different rat tissue lysates with 15 μg of total cellular protein in each lane. 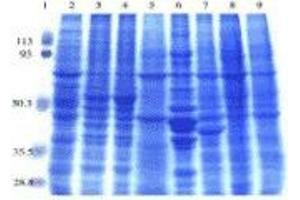 Proteins were separated in 4-20 % SDS-PAGE gel and transferred onto nitrocellulose membrane. The rat tissues included in the blot are adrenal, cerebellum, cerebrum, small intestine, skeletal muscle, stomach, testis, and thymus.